After dropping "Let You Go" for about 3years (2015)now, people will think this amazing disc jockey will 'leave his voice just through turntable scratching' but that's the contrary as he drops this new jam titled "DEKUNLE" to start 2018.
is still rings in our head and it, most notably received massive airplays across Radios and across cities. Opeyemi Adebayo known as Gabcos is a young and aspiring talent who hails from Ekiti state, Nigeria. He is also an English Education graduate of the National Open University of Nigeria (NOUN). 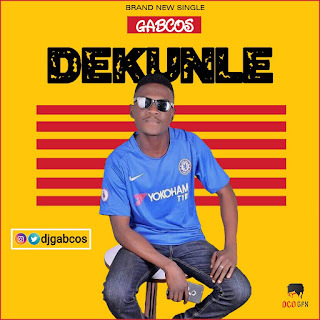 This tune DEKUNLE was produced by Ace Music Producer Emino, mixed and mastered by Fizzy beats.